We’ve been tracking the development of Little Nightmares since the game was initially revealed as Hunger all the way back in early 2015. Following the game’s initial reveal we talked with Tarsier Studios about the game in a lengthy exclusive interview and here we are today, discussing what is now known as Little Nightmares. I recently sent some questions over to Senior Narrative Designer, Dave Mervik to learn some new details about the game now that it’s further along in development. Before you check out the interview you may want to take a quick look at the initial gameplay reveal trailer. We hope you enjoy the interview and please let us know what you think of the game in the comments section. ONLYSP: For our readers that haven’t heard about Little Nightmares yet, would you mind providing a short synopsis of what the game is and what it’s about? Dave Mervik: Little Nightmares is a suspense-adventure game about a young girl named Six who is trapped in a place called The Maw. It’s not a very nice place to be either, so naturally she wants to escape, and it’s your job to help her do that. ONLYSP: The last time we talked to you about “Hunger”, now called Little Nightmares, was way back in early 2015. How has the game shaped up since then? Any major changes to the core formula of the game? Mervik: The core of the game is the same as it was back then. It’s a balanced mix of platforming, hide & sneak, playfulness, and exploration – all drenched in a rather unnerving atmosphere! The only noticeable change since we spoke back then is that the game is farther along now, which means you start to see the finer details that really bring The Maw to life. ONLYSP: You showed off the game for the first time on IGN back in August. How have people responded to the game so far? Mervik: People have reacted really positively. Thinking back to those months where we were applying for financial support just so we could make some sort of prototype, to be now hearing the reaction at places like Gamescom, EGX, and Igromir – well, it’s more than a little surreal! This being a small Swedish company, no-one really wants any of that pre-release hyperbole, we’re just trying to stay honest and give a fair account of what people can expect next Spring. The fact that people are still finding that exciting makes us feel very very happy! ONLYSP: The monster shown off in the gameplay video acts pretty similar to the AI found in Alien: Isolation, in that it doesn’t seem to be following any predefined paths and reacts to what the player does. Can you go into some more detail on that process? Mervik: While we’ve kept the antagonist AI relatively simple compared to that of Alien: Isolation, we have made a number of choices that make them feel similarly alive and unpredictable. For example, instead of detection radius, we use a more realistic detection of the player, where we employ a peripheral vision angle calculation to determine whether the player can be seen from the eyes of the AI. They will also react to player sounds by calculating the physical distance to the sound and if they ‘hear’ it, they will react accordingly. Having ‘seen’ or ‘heard’ the player, the AI will use things like ‘last known position’, ‘last heard sounds’ and ‘predicted sound location’ to search for the player. It’s all so much cleverer than I am, but the effect of it can be felt by everyone! ONLYSP: Will the narrative play a big part in Little Nightmares, or is it a story that’s more up to player interpretation? Mervik: I’d say that it’s both. The story of the place is very important, but player interpretations of what that story is may differ from person to person. I mean, we’re not just leaving it totally open; there is a definite narrative drive throughout the game. We just think that it’s way more rewarding when you feel like you’re engaging your brain, rather than sitting there as a passive spectator being told exactly how things are. ONLYSP: I didn’t notice any dialogue in the gameplay video, is that true throughout the entirety of the game, or will there be any sort of narration? Mervik: Yeah, there’s no dialogue in the game. That’s also part of this interpretive approach to the storytelling. 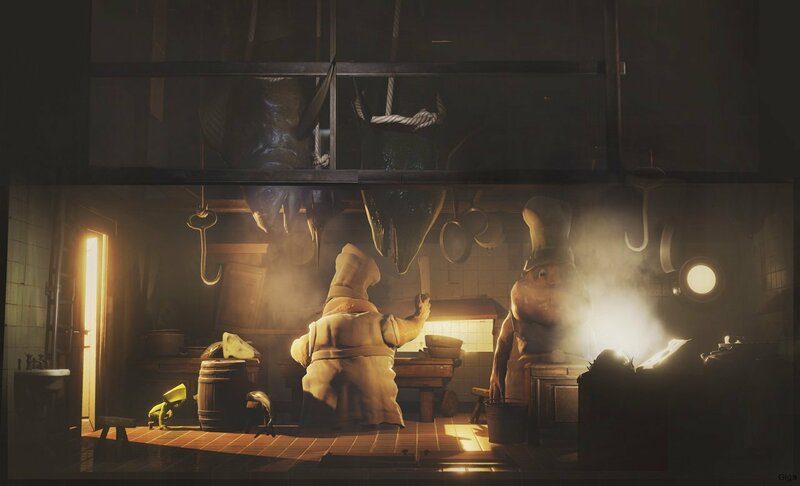 Dialogue can hide a multitude of sins, and we want to ensure that the story of Little Nightmares exists in the world, not just a few expository cutscenes. ONLYSP: How many hours of gameplay do you expect players will encounter while playing Little Nightmares. Mervik: It really depends on how you like to play. We place a lot of emphasis on exploration, and if you make the most of that, you’re going to be in The Maw for a while longer! Right now, though, our estimate is somewhere in the region of 6-8 hours for a playthrough. ONLYSP: You “finally” announced that the game is coming to the PS4 (also Xbox One and PC), after not correcting us when our original interview with you was published ;). I’m curious as to what your thoughts are on the recent PS4 Pro announcement and how HDR and 4K will affect gaming moving forward. Mervik: The truth back then was that the platform wasn’t decided, so there was nothing to announce. I think people assumed it was a PS4 exclusive because of our history with Sony, so that was the story that stuck, it just ended up being not actually true! As far as things like PS4 Pro and Xbox Scorpio goes, it’s certainly an interesting change in the standard console lifecycle. I’ve been used to being happy with my console for at least five years or so, but now we’re 3 years down the line and already looking at an update. Other than the massive hit on my wallet, I think it’s a positive sign. As a big fan of VR, I’m really happy that it’s being supported in such a significant way by these new machines. ONLYSP: Since you’re working with VR for your other upcoming title, Statik, is there any chance of some form of VR being implemented in Little Nightmares? Mervik: We’ve had that question a lot lately and, if I’m honest, I hadn’t really considered it … but it seems everyone else has been! The truth is that I don’t know what we’ll be doing in the future. The focus right now is on making sure that this game is as high quality as possible. If we don’t manage that, then there’s no point talking about the future at all. But there is a world outside of The Maw, and we would want to tell those stories in the best way possible. If VR turns out to be one of those ways, then I’ll be a happy little camper! ONLYSP: Anything else you’d like to let us know about Little Nightmares? Little Nightmares is expected to release in early 2017 on the PS4, Xbox One and PC. Stay tuned for continued coverage by following OnlySP on Facebook and Twitter.